Oh, have I got a treat for you today. Behold the brain-busting beauty of Barnard 59! This incredible picture was taken by the MPG/ESO 2.2-metre telescope at the European Southern Observatory’s La Silla Observatory in Chile. The chunk of sky shown in this image is pretty big for a deep sky photo – about 6 arcminutes on a side. For comparison, the Moon is about 30 arcminutes across, so we’re still talking just a teeny region. But look at all those stars! Of course, it’s not the stars that draw your attention: it’s the not stars. This region of the sky, in the constellation Ophiuchus, is toward the center of the galaxy, and is lousy with gas and dust – the latter of which is actually composed of complex chains of molecules. These form grains astronomers call dust, though they’re not like the bunnies you find under your dresser: these are more like particles of smoke in size. Ethereally thin by earthly standards, they form clouds that are still so large, light years across, that they are effectively opaque. They block the light coming from stars behind them, so in rich star fields like this one the dust clouds are made visible by their silhouettes. 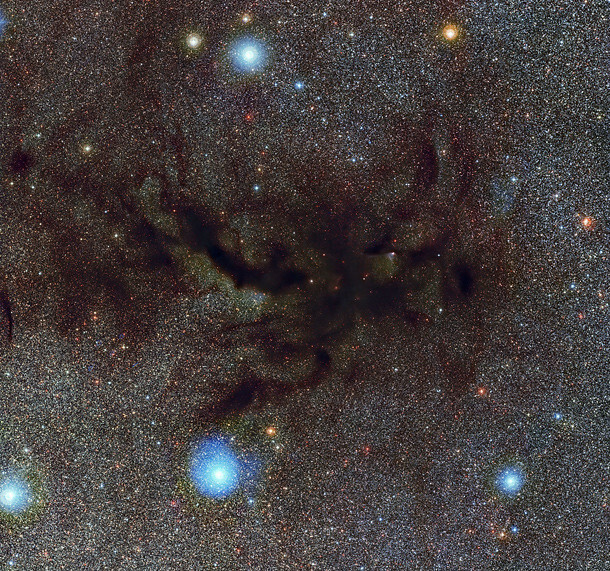 What you’re seeing here is one particular complex of dust in the much larger cloud called the Pipe Nebula. The picture inset here shows the whole thing, and the reason for the name is obvious. Barnard 59, seen in incredible detail above, is the mouthpiece of the pipe. You really need to take a look at at least the medium resolution image. You can see tendrils, wisps, and many other features. One of the neat things that you might miss at first is how the dark clouds change the colors of stars behind them. Start in the center of the cloud, then look near the edge, where the cloud starts to thin out, and you can see stars once again. See how the stars along the edge are redder than the stars farther out? Dust scatters blue light – a blue photon sent straight at us by a star can hit a dust grain and be sent off in another direction, missing us. There’s enough dust at the edge of the cloud to do that. But toward the center of the cloud we’re through a lot more of that floating junk, so much that it absorbs the light coming from behind it. This effect is called interstellar extinction, and it’s kind of a pain when you’re trying to look at stuff through a cloud. However, it does make for a very pretty effect in pictures like this. One more thing. See those fuzzy stars in the center of the cloud? Those are stars being born right before your eyes! These clouds can have very dense, cold clumps of material which can collapse to form stars. Usually invisible to optical telescopes – these ones are on the near side of the dust cloud, which is why we can see them at all – they glow brightly in infrared, and telescopes that can see out past the visible part of the spectrum see these very clearly. And yeah, you really want to click that link. It’s eerie and beautiful and spectacular. All of this is another reason I love astronomy. One person’s meat is another person’s poison. If you want to study stars, dark nebulae are a pain. But if you want to study how stars form, they’re the first place you want to look!